Frank Palmer Speare retires, Carl Stephens Ell inaugurated as second president. University added to the list of institutional members of the New England Association of Colleges and Secondary Schools. First Northeastern University teaching fellows (Department of Chemistry). College of Business Administration and College of Liberal Arts accredited by the University of the State of New York. Department of Chemistry accredited by the American Chemical Society. University made an institutional member of the American Council on Education. Chapter of Tau Beta Pi, national honor society, established in the College of Engineering. University made an institutional member of the Association of American Colleges. Curriculum in Chemical Engineering accredited by the Engineers' Council for Professional Development. 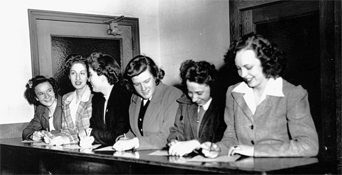 Women students admitted to the Day Colleges. School of Law accredited by the University of the State of New York. The University accepts its first sponsored research contract, a $10,000 project for the Office of Naval Research. School of Law made a member of the Association of American Law Schools. College of Engineering offers the University's first graduate courses. Fiftieth Anniversary convocation and banquet, October 2.